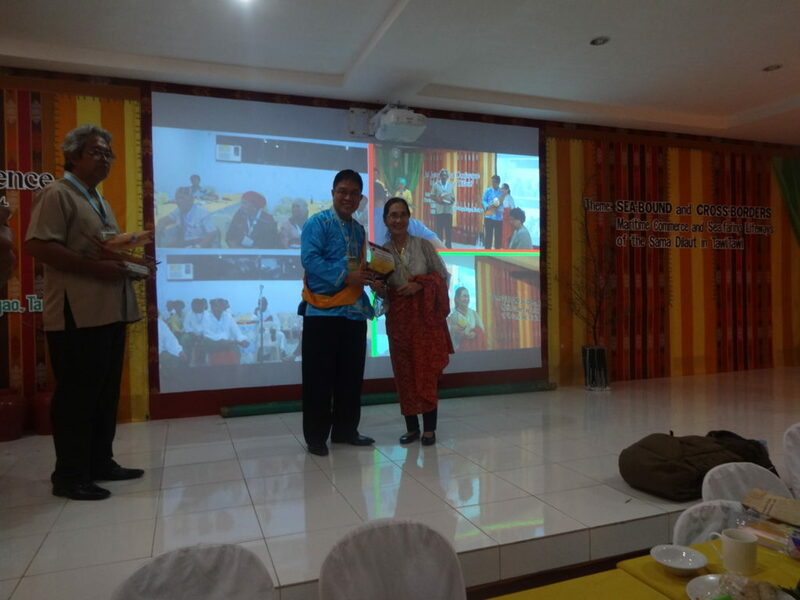 BONGAO, Tawi-Tawi- Ms. LIgaya Fernando-Amilbangsa presented a paper on Igal/ Pangalay on the first day of the 1 st International Conference on the Sama Badjao (Sama Dilaut) held at the Marine Science Museum of the MSU Tawi-Tawi College of Technology and Oceanography. The conference, which was held from December 1-3, 2015, had the theme: Sea-bound and Cross-borders Maritime Commerce and Sea-faring Lifeways of the Sama Dilaut in Tawi-Tawi. Ms. Amilbangsa was assigned to give a lecture on the topic, “Negotiation and Accommodation of Igal as Aesthetic and Performative Ritual.” In her lecture, she highlighted the accomplishments of the Sama Dilaut and noted that igal “asserts the ethnic legitimacy of the Sama Dilaut in a community of strongly-held customs and prejudices, but inhibits social stratification in dance… thus, igal has a dignifying effect and serves as a unifying force among the natives. On the second day of the conference, “Memories of the Sea,” a documentary about the Badjaw in Roxas Boulevard, Manila by Ms. Nannette Matilac was shown to the participants. The three-day workshop was very successful, and generated a lot of interest from the participants, who represented various stakeholder groups.